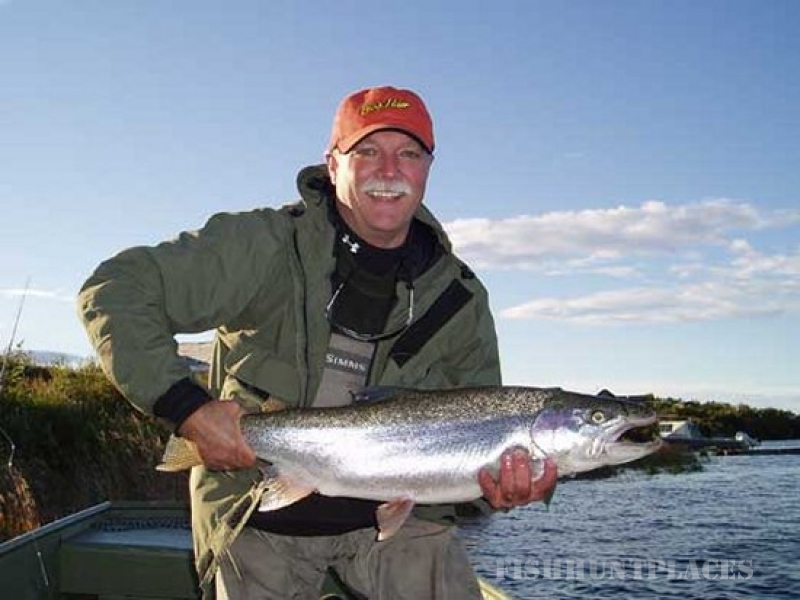 Rainbow Trout Fish Alaska Magazine identified the Naknek as Alaska's #1 destination for trophy rainbows! That is a big statement, but we think you will agree that the river can live up to the claim. The average fish will still be in the 2-5 pound range, but there will be a realistic possibility of bigger bows - up to 36 inches long - almost every day. If rainbows are your target fish, the best time is early and late season. 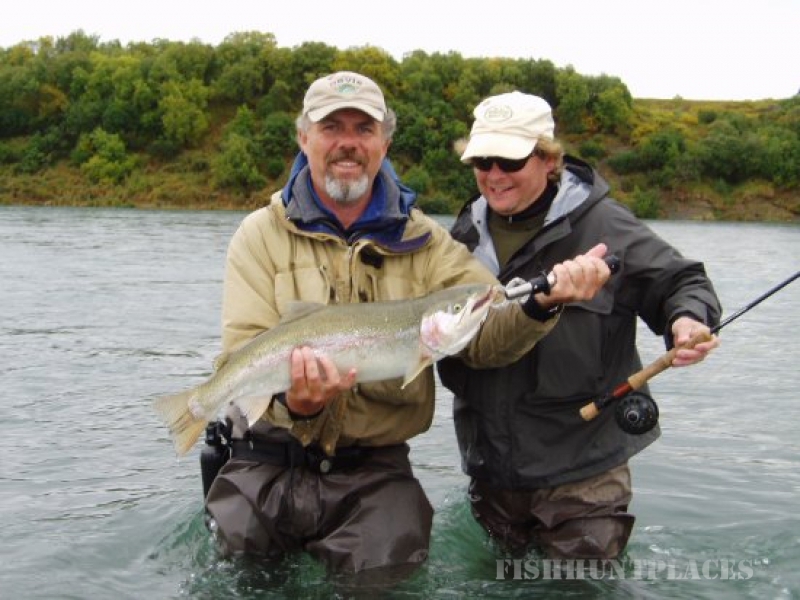 Arctic Char & Grayling These are year 'round residents and make great fly rod targets. Grayling are especially eager to rise to a dry fly in early season, making them an ideal quarry for a 4 or 5 wt. fly rod and a floating line. The arctic char look a lot like brook trout, only larger. 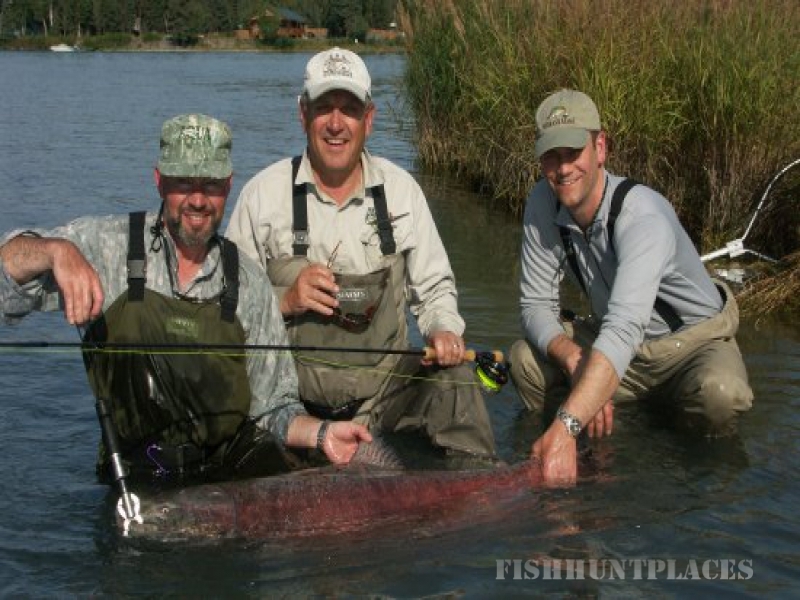 The best techniques for them are the same as for rainbows, so basically, anytime you are fishing for rainbows, you are also fishing for char whether you realize it or not. They spend a lot of time tucked in behind the spawning salmon, feasting on eggs, making egg flies their number one weakness. King Salmon There is a reason why these babies are called the Kings - nothing in Alaska grows to the massive sizes of a chinook salmon. They begin running in mid-June, continue through much of July and spawn in August. 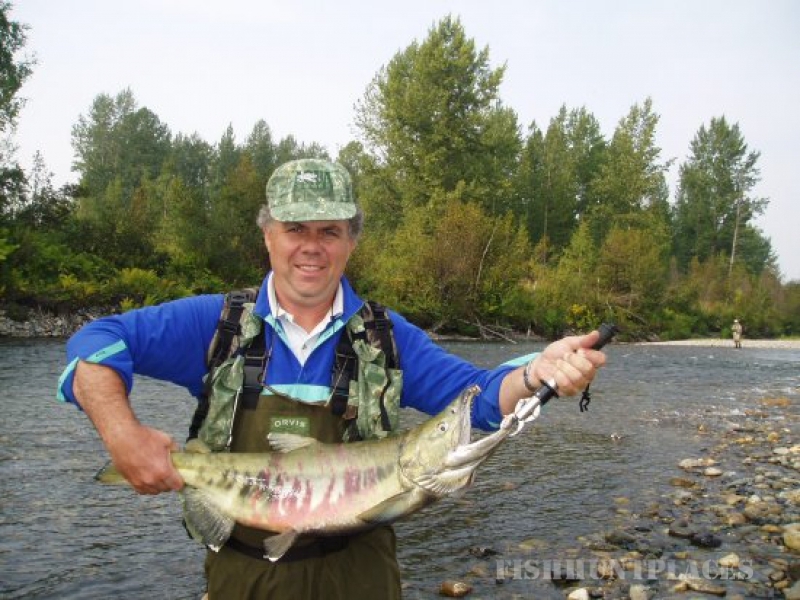 Their eggs are also huge, (8 - 10mm) making king salmon eggs one of the very favorite treats for a trophy rainbow in August. Most people in Alaska fish kings with heavy spin or baitcasting gear, using deep diving plugs, spin-n-glows, or large spoons and spinners. They can be taken on fly gear, but the battles are epic and the angler loses the struggle much more often than he wins. Sockeye Salmon These are the best eating and most prolific salmon in the system, numbering upwards of 2 million per year. Everyone seemingly knows how delicious they are, but few realize that they are also tremendous fighters, especially on a 7 or 8 wt. fly rod. From late June through July, they can provide almost constant action. Their huge numbers are the reason why this area has such an abundant population of rainbows and bears. Chum and Pink Salmon Chum are called dog salmon, because they are a favored food for the sled dog teams, but you will call them something else entirely as they nearly tear the rod from your hand and bust up your tackle. Some pink salmon will run every year, but the run is much stronger in even years. Both will be most effectively fished with streamers and both will run in July and early August. Silver Salmon Last, but certainly not least, is the silver salmon. These incredible gamefish are easily my favorite salmon, getting large enough to put on a show and delicious on the table. They are also the most aggressive of the salmon, chasing streamers and even taking skating dry flies on occasion. They begin moving into the rivers in early August and the run continues on into mid-September. I usually use a fly rod in the 7-9 wt. range or a spinning rod loaded with 8-12lb mono.